We have arrived! 2013! Moving into a wonderful New Year, leaving behind all the scary stories of what might happen to us with the end of the Mayan calendar, and now we face this magical New Year. When I add the numbers I get the magical 6. I love this number a number that I use in my readings. I believe we are all equipped with our own “magic” and this year we can start by believing in it! To be discerning and make every decision and action count should also be in every person’s agenda. I believe that if we allow the rush that does not allow us a mindful response to our actions, we quite often get it wrong. Our situation is at a very “sensitive” moment in Time and History and the Ego of Man is no longer supporting the healthy potential of our Earth. We are powerful and can make this year our success story if we remember that each decision we make has long lasting consequences. The energy of the 6 is one that is described in the Tree of Life as a number of Balance, Equilibrium, Beauty and Harmony. This is my wish for us all this year! And our precious Earth and all its life forms! Starts 4 FEB, a ten week Intuitive course. I only take 6 people. Please phone Lesley for more information if you are interested. This course does not only teach you to read the Tarot but to learn about yourself and most importantly to connect to your own Intuition and use it! We have a special day planned for your loved one. A packaged treat of treatments and a Reading! If you are looking for something special to gift this could be your answer. R400 only! The treatment day will be on Saturday 16th to accommodate those who work. The offer is open until then. I will be restarting a small meditation group – please phone Lesley if you are interested. And remember our new range of beautiful and very affordable jewellery, Pashminas of pure yak wool from Tibet and Silk scarves from India. SUMMER wax specials … phone for more information: underarms, legs and bikini. If you are planning on travelling or picnicking whilst this summer lasts don’t forget your HOT BOX … let it do the cooking while you travel to your venue! 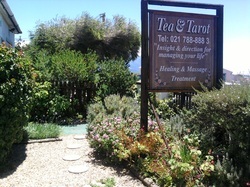 Phone Lesley 021 788 888 3 for appointments … readings, healing, massage, counsel.